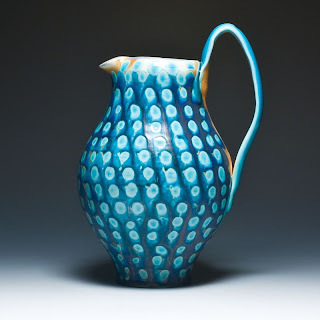 When I am throwing enough pottery to fill the kiln on the schedule I need to keep, I sometimes find myself nursing a repetitive stress injury. It's a quandary, because - obviously - I have to stop throwing long enough for my wrist to heal. Answer? Why, handbuilding, of course! Using an existing piece, glass or metal, as a mold has never been my favorite way to work. It seems too...what?...derivative, I suppose. 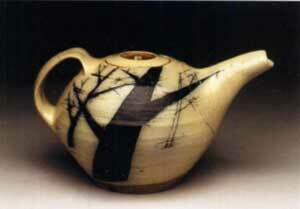 So often all of the details are just impressions of a surface some other designer created. Why should somebody else have all the fun? 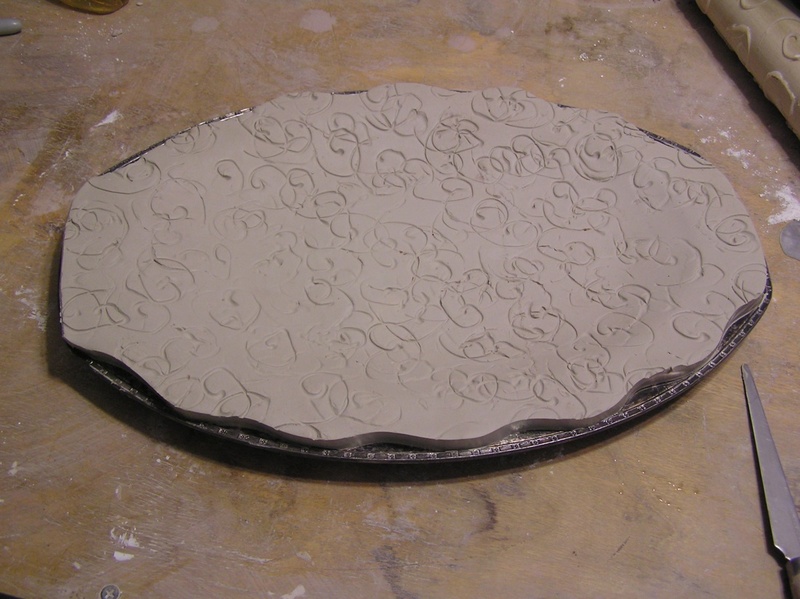 When I found this silverplate oval platter with no texture or detail at Augusta's new Goodwill store, I saw a solution to both my problems. Because it is a featureless piece, I can go to town on it. I made a texture roller using a fat piece of dowel from Home Depot, and a hot glue gun. Advice: if you are purchasing a hot glue gun for this project, get the more expensive one. I got the little $2.99 special, and found that it squirted out so little glue at a time that keeping a steady line was impossible. 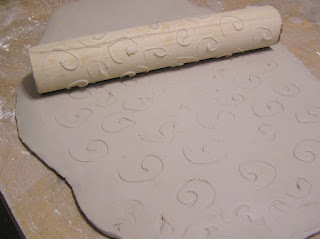 Still, I managed a spiral design. 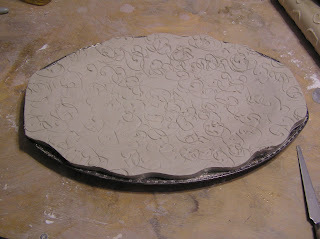 I stretched out a slab, about 1/4 inch thick - I hate a flimsy feel to my pottery. Then I rolled the decorative roller over it, in several directions, so the rough quality of the drawing became a non-issue. 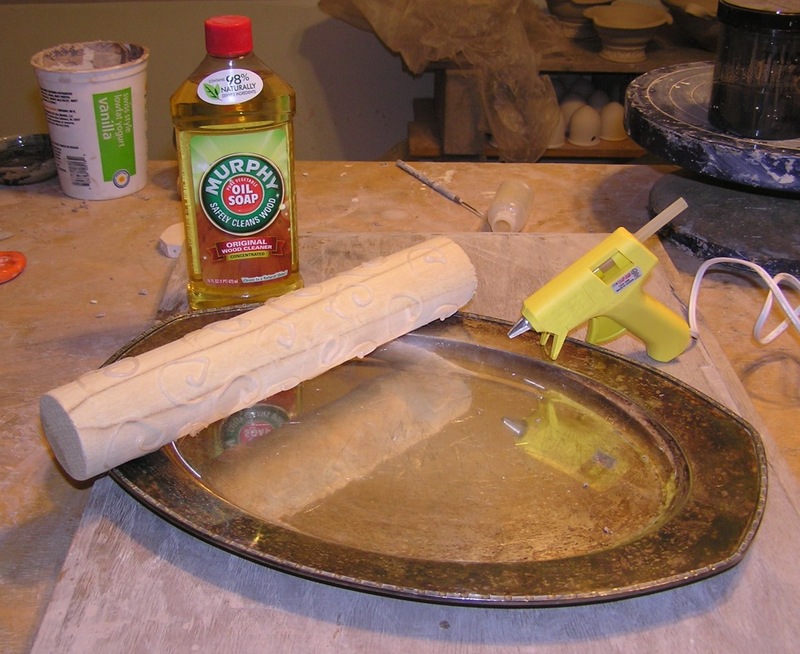 Then I slathered the mold with Murphy's Oil Soap, as a release agent. Clay will stick to anything nonporous, so don't skip this step. 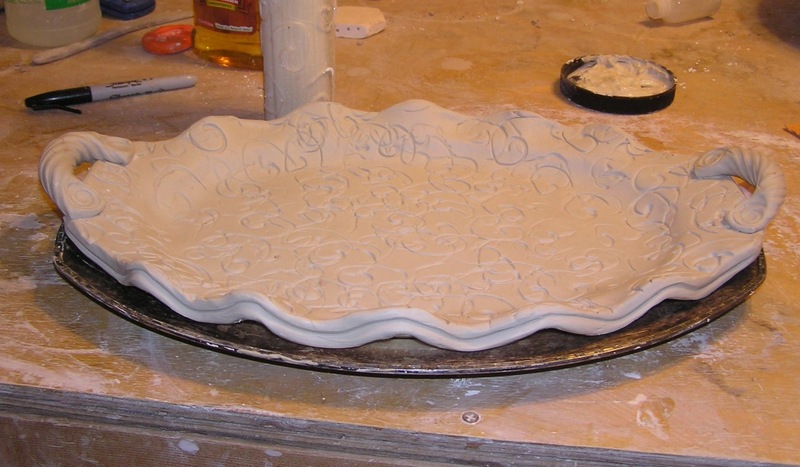 I placed the slab texture side up inside the mold. This particular shape would also work as a hump mold - turning it upside down and laying the slab over the exterior. (That's the next one! )I used to fettling knife to cut a more interesting rim. Then I picked up the mold, slab and all, and dropped it from a few inches above the tabletop, 3 or 4 times.After that, I used my thumbnail to dig a ridge all around the edge, for a double-rime appearance, and attached textured handles. 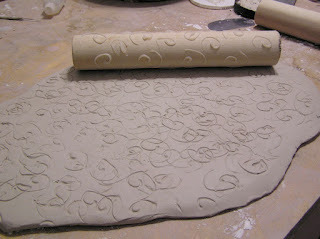 Last, I trailed slip in a design loosely mimicking the pattern left by the roller. Voilà! 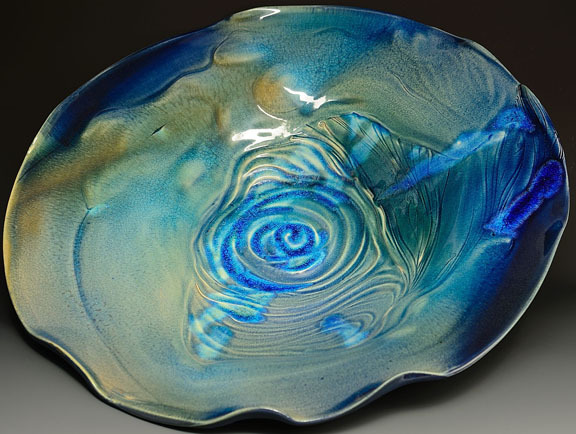 A molded platter that retains sometihing of my aesthetic. 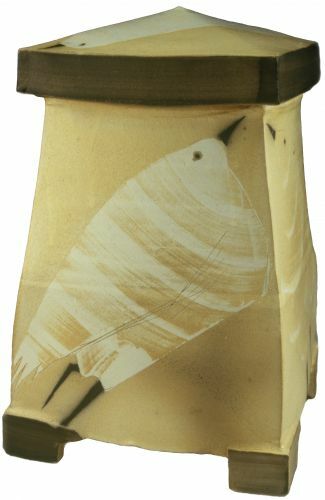 See lot more of Mark's Cone 6 soda-fired work here. Normally an ant, I've had a bit of a grasshopper summer. It was unusually hot in Maine (and everywhere else, I guess?) and way too many times the river called to me in the sweltering afternoons; either that or a nap in the shady bean house, a kind of living gazebo my husband builds every year. Even the laziest week for me still includes at least 30 hours of work, but less work equals less money sure as autumn follows summer. Property taxes and a recent oil delivery have taxed my meager income to the point that at this posting, I am unable to come up with $5 to get a haircut at the beauty school. Nay, nay, don't weep for me! My hair may look like the hind end of a blond yak - if said yak had highlights grown out two inches - but I can't say I regret it: life is short. 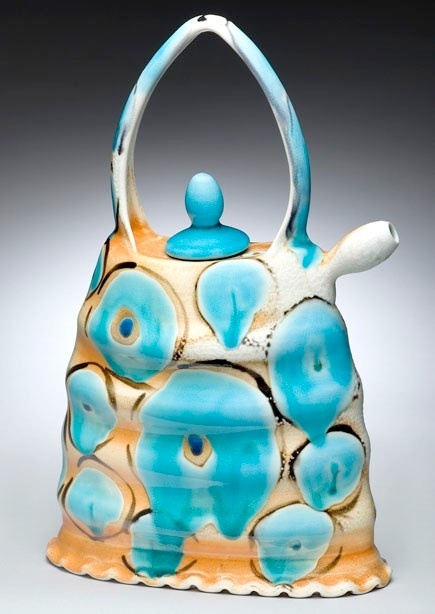 And now I am back in the studio, renewed and refreshed and working like the Energizer Bunny on some special occasion pots: soup tureens (and matching soup cups - thanks, Rob! 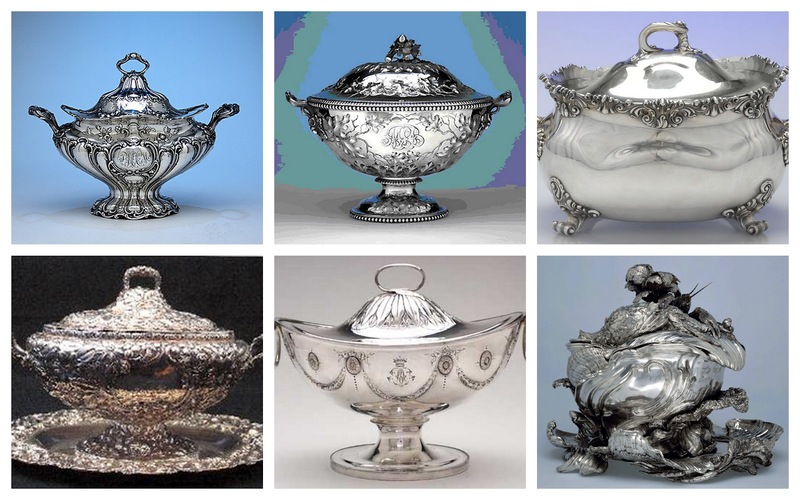 ), gravy boats, platters, and butterdishes. My husband, observing my energy, described it as "shot from a cannon." To me it speaks to the necessity of leaving time for relaxation, for fun - even if your job is fun. I love my work - that was the whole point of choosing self-employment - but 60 hour work weeks without letup can burn out even the most enthusiastic self-starter. Already things are looking up. 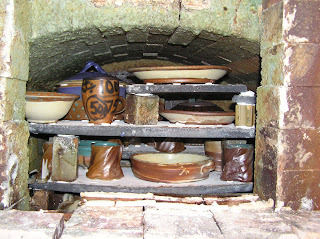 I unloaded a kiln on Sunday, and I've sold most of it already. As soon as those checks clear, I do believe I'll get a haircut. Good news - really nice colors, especially the shinos and yellows. Most of the cobalts turned a lovely violet color. 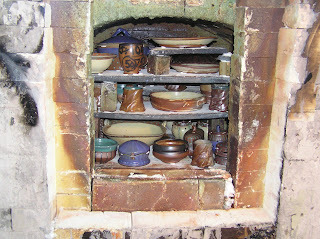 Bad news - A few pieces from this firing were older bisqueware, made of a claybody that has had some technical trouble. Laguna's 910 body has on and of lately had some problems with cracking for no apparent reason. 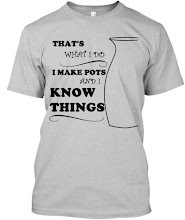 A pot can be just sitting on a shelf, minding its own business, and all of a sudden just - snap - split in two. 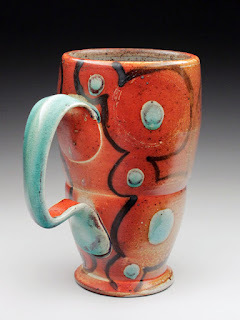 According to my friends at Portland Pottery, this problem is now resolved, but I've heard that a couple of times before, and I ain't going near 910 anytime in the near future. 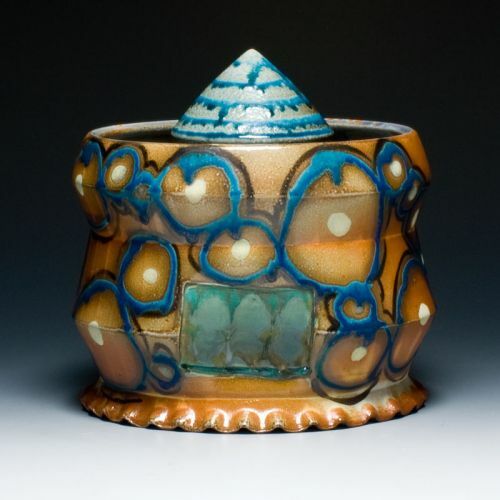 The silver lining, such as it is, is that the bad clay is easily identifiable after it comes out of the glazes firing, but its mottled, yellow-orange coloration on the bottom. They don't all break, but since I never know when one might, I really can't sell them. Good news, and this is a wonder - None of the pieces that I needed for orders were made of the bad batch of clay. 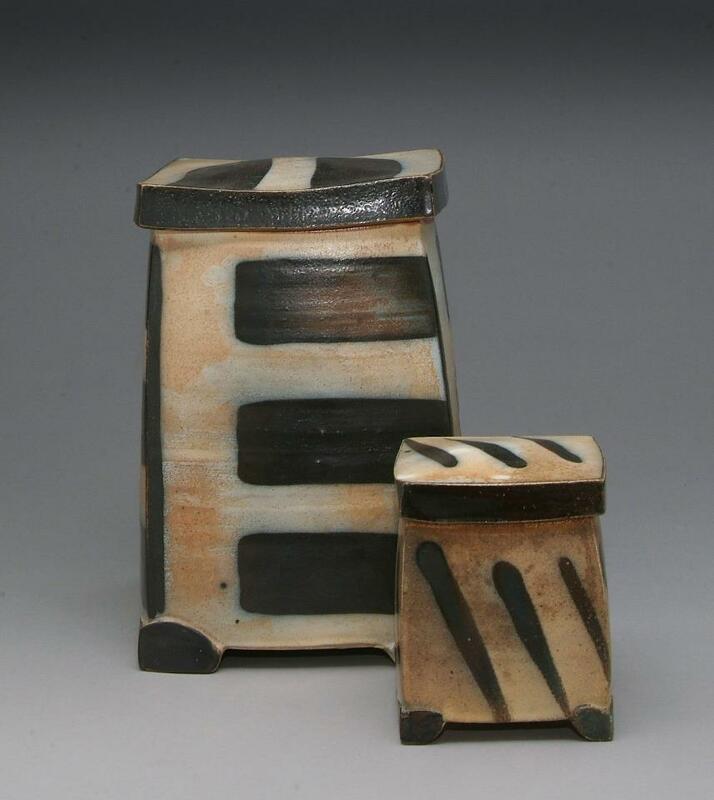 I'll have some photos of individual pieces later. Now it's time for the long process of grinding and buffing, sorting pricing and packing. So, here I was, excited to have the house to myself: Doug is away today and I was planning to get So. Much. Done. in the studio. Yeah, well. I left my clay and most of my tools in the car. Grrr. 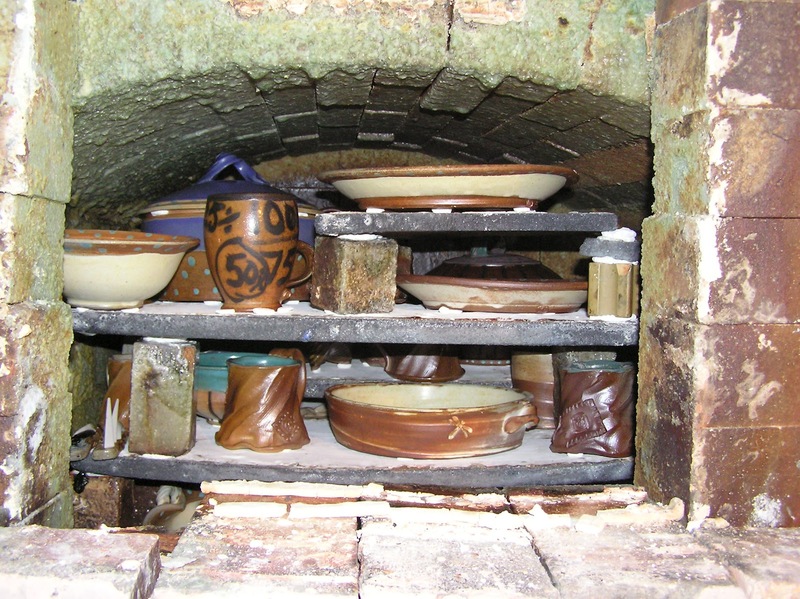 I have a little clay - about 25 pounds - so I will make what little I can with that, and focus on things like butter dishes that are more labor- than material-intensive. And, we get a bonus inspiration post this week, because what I am really dying to make is soup tureens.I've been looking a lot at antique silver and silver plate tureens, mostly from the 18th and 19th centuries. 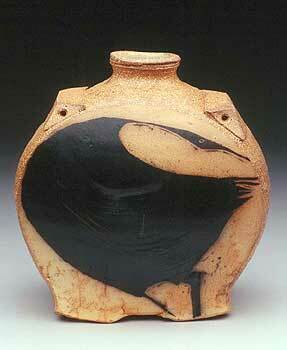 While clearly functional, they are also almost ceremonial in attitude: special occasion vessels. I want to make something with this feeling: a piece that proclaims the occasion. A potential heirloom, if I may be so grand. 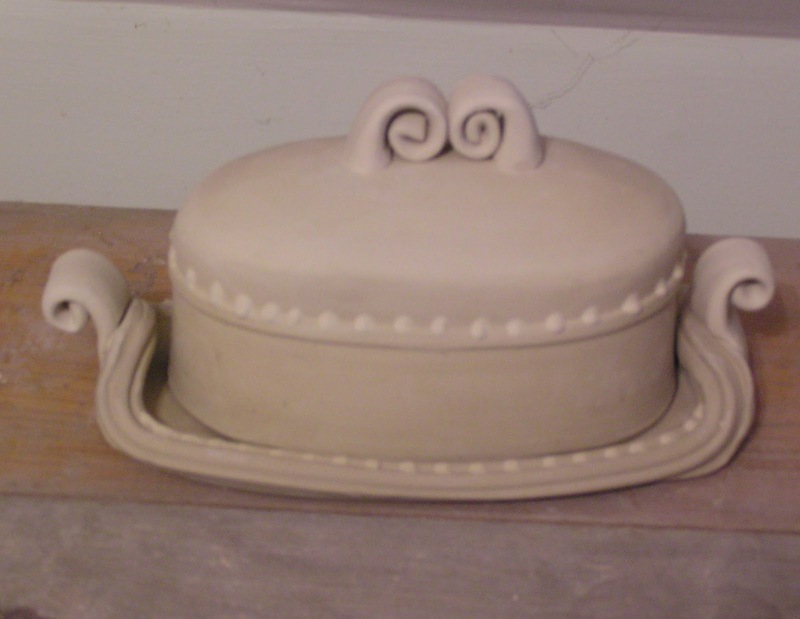 I want to make tureens so badly I could almost make them out of my very will. It's a terrible tickle, like needing to sneeze, with my brain. I just have to preserve this deep inspiration until Doug gets home, with the car and my clay, and I can hole up in hte studio for the rest of the night. See more of Catherine's beautiful oxidation-fired work here. I know I was. My computer is too elderly to accommodate most image-manipulation sites - specifically they usually want a newer version of Flash, which is not compatible with my old eMac. I have a laptop that runs Picasa, but really, I'm not over-fond of Picasa. It's always creating new folders and opening windows that I didn't tell it to, and I can never find anything. Somehow there are always multiple versions of photos I've worked on, which have the same name but are in different folder. Annoying! Just today, I found LunaPic! LunaPic is even better than Picnik, in that it is faster. I think there maybe be fewer "special effects" type tools, but I rarely use those anyway: I mostly just want to crop, brighten, re-size, and adjust the color balance. LunaPic does all that, and can even do animation, a thing I might pursue just for amusement. You can also edit images out of Flickr, Facebook, Photobucket, and Picasa. 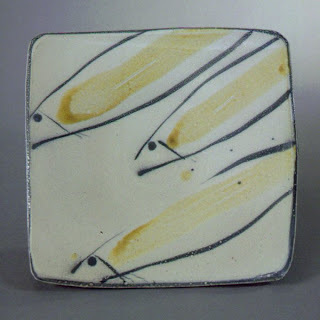 Yesterday - Because I knew I would be loading a bisque today, I limited myself to small items that would have some hope of drying in time for the firing. 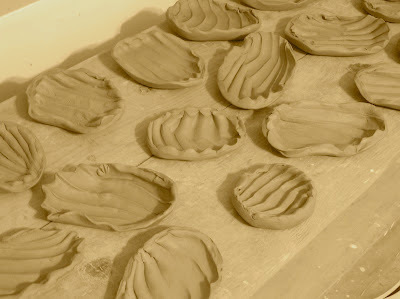 Here are some soap dishes and spoon rests, made by dragging a stretched spring through a ball of clay, and then slapping the resulting textured slab onto the tabletop a few times to distort it. 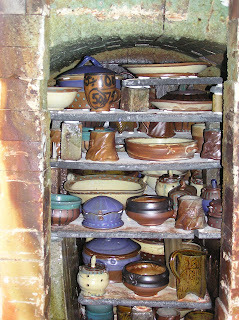 It has been pretty humid lately, and I am not at all sure these will be dry enough by the time I load this afternoon. Today - Grinding and washing shelves, making cone packs, loading the kiln and bricking the door. This will be a half-day as studio work goes; I also need to mow my lawn and vacuum the multitude of spiders out of my home before they take over. 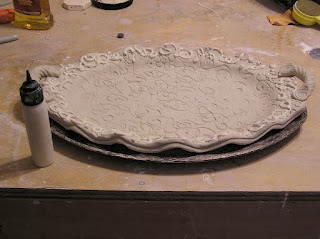 Tomorrow - Bisque firing! And, as is my habit, I will clean up the studio while the kiln is firing. I think of September as a time of new beginnings, a leftover from school days, I suppose. I will be getting back into the swing of a more rigorous work schedule, as my accounts will need inventory for their holiday shopping season. I've definitely got that back-to-school feeling. This guy is a classic. See lots more of Michael Simon's pots here.